Appearing on the front page of the Miami Daily News on August 13th, 1954 was the first of a series of three articles aimed to inform the public about the “disease” of homosexuality. 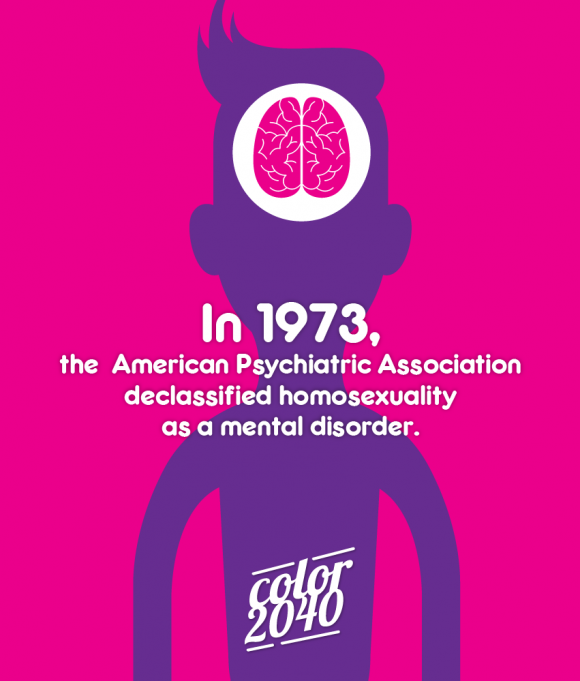 In 1973, the American Psychiatric Association declassified homosexuality as a mental disorder. // En 1973, la Asociación Americana de Psiquiatría descalificó la homosexualidad como un desorden mental. Islam is as clear on homosexuality as the shining sun. Unfortunately some among the Muslims who claim to be scholars or students have exerted a lot to negate this. Be it due to inferiority complex with the west or due to peer pressure, or the fear of not being openly recognized by the organisations and community one works with or due to the fear of having the source of income slashed or simply personal homosexual tendencies or desires or as shaykh salih al-fawzan and scholars truly said that living in non islamic environment makes a person more exposed to falsehood and eventually makes him lighter or easier to accept these flaws due to what he has been seeing around in his society . These are some of the many reasons why those among Muslims unfortunately try to negate or lighten the islamic stance against homosexuality. A simple google, even in Chinese is enough to show the islamic position yet those whom allah deviates , then who can guide them? . This article will enlist very few quotes from the prophet, his companion(s) and some scholars predicting this homosexuality to become wide spread and summarizing the threat it brings upon mankind. Notice that this is the Islamic position and in countries where it has been made legal (after considering it a disease for centuries at stretch) then those Muslims who live in those countries cannot violate the laws of the country by forcing or harming someone. Sure as your personal opinion you can dislike it or simply continue exercising your right to practicing/believing/educating what your faith teaches and this should be fine. وعن حذيفة رضي الله عنه: أنه قال: "لا يكون في بني إسرائيل شيء؛ إلا كان فيكم مثله". فقال رجل: يكون فينا مثل قوم لوط؟ قال: "نعم". Hudhayfa (radhiallahu `anhu) said (which is elevated marfoo`an) " Nothing occurred among the Bani israeel except that something similar will occur in your midst. So a man asked " Will there be among us the kind similar to the people of loot (i.e. homosexuals?) He (radhiallahu `anhu) replied " Yes"
عن أبي هريرة رضي الله عنه عن النبي صلى الله عليه وسلم؛ قال: «لا تقوم الساعة حتى يتغايروا على الغلام كما يتغايرون على المرأة» . رواه الديلمي في "مسند الفردوس". وعن ابن عباس رضي الله عنهما: أن رسول الله صلى الله عليه وسلم قال: «إن من أشراط الساعة» ... (فذكر الحديث، وفيه:) «ويغار على الغلمان كما يغار على الجارية البكر» . Ibn Marduyah related from Ibn `Abbas (raḍiyAllahu `anhu) who related from the Prophet (sallallahu `alayhi wa sallam) who said " From the signs of the hour....(and narrated the entire hadeeth in it it says and that men will marry men and women will marry women) ....and that “people (males) will feel ‘gheerah’ (protective jealousy) for young boys/men just as it is felt for a young, virgin girl. عن ابن مسعود رضي الله عنه: أن رسول الله صلى الله عليه وسلم قال: «يا ابن مسعود! إن من أعلام الساعة وأشراطها أن يكثر أولاد الزنى» . وعن ابن عباس رضي الله عنه أن النبي صلى الله عليه وسلم قال: من أشراط الساعة أن يكتفي الرجال بالرجال والنساء بالنساء ويغار على الغلمان كما يغار على الجارية البكر وعند ذلك تكون الأمراء فسقة والوزراء فجرة.. الحديث بطوله.. رواه ابن مردويه. وفي رواية أخرى ويخطب الغلام كما تخطب المرأة ويهيأ كما تهيأ المرأة. Ibn `Abbas (radhiallahu `anhu) narrated that the Messenger of Allah (sallalahu `alayhi wa sallam) said " From the portents of the hour is that the men will be satisfied with men and women will be satisfied with women and (men) will have protective jealousy for the boys (or men) just like one has for the virgin girl and that will be when the women are adulterous or corrupt and the ministers are fujjar..
and men will marry boys just like (how one used) to marry women and prepare themselves (for their homosexual partners) just like how the women dress (prepare) themselves. وعن عبد الله بن مسعود رضي الله عنه: أنه قال: "أنتم أشبه الناس ببني إسرائيل، والله؛ لا تدعون شيئًا عملوه إلا عملتموه، ولا كان فيهم شيء إلا سيكون فيكم مثله ". فقال رجل: أيكون فينا مثل قوم لوط؟ فقال: " نعم، ممن أسلم وعرف نسبه". يا ابن مسعود إن من أعلام الساعة وأشراطها أن يكتفي الرجال بالرجال والنساء بالنساء . Although this Hadeeth is quite weak, Imam Bayhaqi (rahimahullah) after quoting a similar condensed version of the Hadeeth in question, has stated that majority of this Hadeeth is sufficiently corroborated. Hafidh Ibn Kathir (rahimahullah) after quoting Imam Bayhaqi (rahimahullah) further affirms this. Anas radhiallahu `anhu said that the Messenger of Allah (sallalahu `alayhi wa sallam) said " when my ummah legalizes five things then they are bound for destruction. The prevalence (or uprising) of cursing (and swearing). Drinking of alcohol (using a variety of name such as the recent halal beer), wearing of silk (by men) ; when girls are taken (as entertainment such as dance shows, concerts, etc) and when men are (sexually) satisfied with men and women with women. سَيَكُونُ فِي هَذِهِ الأُمَّةِ قَوْمٌ يُقَالُ لَهُمُ اللُّوطِيُّونَ ، عَلَى ثَلاثَةِ أَصْنَافٍ : صِنْفٌ يَنْظُرُونَ ، وَصِنْفٌ يُصَافِحُونَ ، وَصِنْفٌ يَعْمَلُونَ ذَلِكَ الْعَمَلَ " . There will be in this Ummah a nation which will be called Sodomites in three different kinds: one of them will only stare (lustfully at the same gender), the other one will touch/shake hands, and the third will actually do that action.